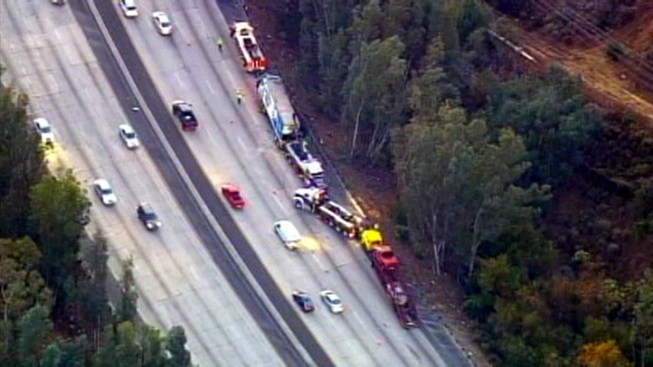 Crews move a big rig to the side of the 101 Freeway early Monday. Lanes on the southbound 101 Freeway were closed early Monday after a crash involving a big rig in the Calabasas area. Two lanes were reopened at about 6:30 a.m. Traffic was slow before Las Virgenes Road as crews attempted to clear the wreckage. 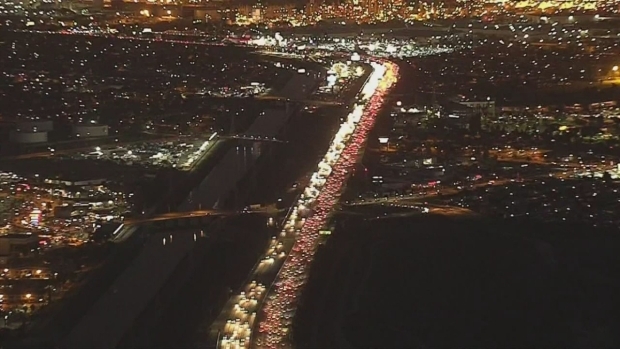 Motorists exited the southbound 101 Freeway at Lost Hills Road, but travel on surface streets also was slow Monday morning. The crash, involving a big rig and car hauler, occurred at about 3:30 a.m. The 45,000-pound big rig toppled across three lanes. A heavy duty two vehicle pulled the big rig to the side of the freeway, allowing the California Highway Patrol to reopen a few lanes.